One of the luxuries of being a film critic is the frequent ability to sidestep some of the less appealing aspects of going to the movies—namely, the kind of misbehavior that theater chains now discourage through “funny” pre-show messages. We critics get a little spoiled, hunkering down in the exclusive company of fellow film lovers, who wouldn’t dare talk during the feature or cut through the darkness of the auditorium with a distracting pocket of cell-phone light. It’s for this reason, I suspect, that some of my peers do everything in their power to avoid public screenings at a major festival like Toronto—especially when the same movies can be seen at much more chill press and industry screenings. Why fight strangers for elbowroom when you can spend a week or more in the P&I bubble? I won’t deny the benefits of staying far, far away from the madhouse of festival Gala screenings. But those who never brave the crowds of a major premiere also miss out on a rare communal experience; some movies are just meant to be seen with a giant audience. Take, for example, Nightcrawler (Grade: A-), the darkly funny and wildly entertaining directorial debut of Dan Gilroy (brother of Tony). Just a few hours ago, at the end of my second day at TIFF, I sat down for the world premiere of this biting character study, the black-comic origin story of a distinctively American monster. Exhilaration seemed to pass through the audience like an electric current, flaring up in sparks of nervous, shocked laughter. The room was feeding off of its own energy, an elation generated by the audacious movie event unfolding in front of us. Shot by the great Robert Elswit (There Will Be Blood), who brings out the nocturnal menace and beauty of Los Angeles, Nightcrawler is the kind of slick first feature that only plugged-in Hollywood royalty can get made. (Most first-timers don’t score casts and crew this high-profile.) But it also demonstrates that Gilroy is a natural-born director, possessed of great confidence and verve, and that he’s a much better screenwriter than his resume (Real Steel, Two For The Money) would suggest. First and foremost, the film is a showcase for its wiry and wired star, and for the fascinatingly amoral anti-hero he brings to life. In the most perversely charismatic performance of his career, Jake Gyllenhaal slips into the oily skin of Lou Bloom, the living embodiment of self-actualization gone wrong. A petty criminal looking for any golden opportunity he can exploit, Lou talks almost exclusively in pithy nuggets of career advice, the business tips and rules for success he’s absorbed like a sponge over the years. First seen scrounging for scrap metal, he quickly catches wind of a lucrative, extreme growth industry: Zipping around the mean streets of Los Angeles in the wee hours of the night, filming car accidents and bleeding crime victims, and then selling the guerilla footage to the morning news. As (brilliantly) played by Gyllenhaal, who spends the whole film perched on the edge of hysteria, Lou is plainly a complete basket case. But he’s also very good at what he does, thanks to both his maniacal drive and his complete lack of scruples. Securing the assistance of a grossly underpaid subordinate (Riz Ahmed), Lou works out a cushy arrangement with a desperate producer (Rene Russo), their subsequent relationship taking on some very dark and uncomfortable overtones. (For comparison’s sake, imagine Travis Bickle had a real bargaining chip to use on Betsy.) Gilroy shares with Martin Scorsese a comingled awe and disgust with corrupt men; like Lou, the filmmaker is hooked on the danger of this unlikely livelihood—on the sheer moxie of a death-and-destruction parasite, earning his keep off of the misery of a violent city. Bracing though it often is, the film’s cynicism is a little old-hat: Gilroy has updated the media satire of Network for the Google Age, inventing a protagonist who wields information like a weapon. The genius of the film lies not with its damning critique of an unethical industry, but in the sick, outlandish lengths its main character goes to game the system. He’s the modern go-getter as total sociopath—and also, in his growing appreciation for the art of his “craft,” a proxy for obsessive filmmakers of all walks. When Lou begins to shape the stories he films, literally tampering with a crime scene to get a better shot, he becomes a kind of soulless huckster artist. A star is born, in the spotlight headlights of an overturned automobile. 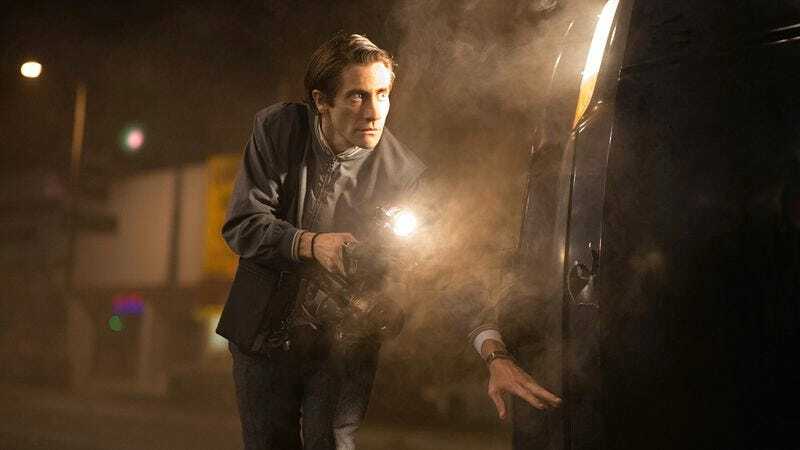 While watching Nightcrawler in a packed house only added to its spooky, magnetic power, there are times when seeing a film with a big group can actually be quite alienating, even lonely. For instance, I sat poker-faced during the first Toronto public screening of Barry Levinson’s The Humbling (Grade: C-), a shrill and rambling Philip Roth adaptation starring Al Pacino as a stage veteran losing his gifts and his marbles. The audience roared with laughter through every witless minute of this folly, though I suspect that was partially the Gala effect: A gracious, smiling Pacino ambled onstage before the screening, priming everyone to love one of the rare recent occasions in which he actually showed up for work. Pacino overacting is always more fun than Pacino underacting, but he’s playing an idea instead of a person here, and the film on a whole plays like some laughless comedic spin on Synecdoche, New York, complete with some stage/life blurring and Dianne Wiest. Not even the normally unassailable Greta Gerwig, grossly miscast here as a young temptress, escapes unscathed. The presence of key cast members—as well as some sincere, prescreening remarks about the late James Gandolfini—may also help explain the rapturous applause that greeted The Drop (Grade: C+) at its first public screening, which I just barely managed to get into. An ultra low-key Brooklyn crime drama from the director of Bullhead and the writer of Mystic River, the film casts Tom Hardy as an almost comically gentle bartender who gets into some serious trouble when his place of employment—a neighborhood dive operated by his cousin (Gandolfini, in his final role), who got muscled into allowing Chechen mobsters to use it as a dirty-money bank—gets robbed. The film coasts in first gear for most of its runtime, spending long stretches just hanging with Hardy’s character, the woman (Noomi Rapace) he casually romances, and the cute puppy he takes in. The performances are all strong; especially good is Bullhead star Matthias Schoenaerts, rocking a flawless American accent to play a hoodlum whose fearsome reputation precedes him. Hardy’s unflappable calm makes sense in retrospect, the film building to a fairly effective reversal of expectations. I’d knock The Drop up half a letter grade were it not for its truly ruinous final scene—a last beat that stinks of studio interference, or at least of a failure of nerve on the part of the filmmakers. Judging from the glowing response of the room, however, I may be in the minority thinking so. Ending problems also plague the Cannes holdover Force Majeure (Grade: A-), which skates right past an absolutely perfect conclusion to land on a more muddled final note. But that’s about the only serious flaw I can find in Swedish director Ruben Östlund’s damning, frequently hilarious study of imploding male ego. A family vacation at a French ski resort hits the rocks when dad (Johannes Bah Kuhnke) suffers a critical failure of nerve, totally abandoning his wife (Lisa Loven Kongsli) and two young children during an apparent avalanche. It’s a false alarm, and everyone is okay, but the repercussions of the man’s flight reverberate through the rest of the week, eventually even complicating a relationship between another couple. At Cannes, many drew comparisons between another, superior festival favorite, whose name I’ll omit here, as its power derives from an element of surprise. But Force Majeure takes a different tack than that masterpiece, finding quite a bit of comedy in the meltdown its protagonist suffers, while also plausibly exploring how a couple might deal with the fallout of such an incident. It’s formally masterful, too, with Östlund employing carefully framed long takes for both dramatic and comedic effect. Ignatiy has already catalogued the flaws of The Lesson (Grade: C-)—though he’s a little too kind, by my estimation—so I won’t waste much space on that sub-Dardennes portrait of economic desperation, which sticks the knife in early and often. At best, the film could work as comedy for some, given the ludicrous extent to which its Bulgarian filmmakers pile the misfortune onto their long-suffering teacher protagonist. (When said teacher sets a trap for her thief of a student, then discovers that she needs something close to the exact amount she wasted as bait to save her home, all I could really do was laugh.) But the humor is questionably intentional, and the deck is so thoroughly stacked against the heroine that it’s impossible to take the thing seriously as a vision of hardship. An early disappointment of the festival, at least for yours truly, was A Pigeon Sat On A Branch Reflecting On Existence (Grade: B), the last installment in a trilogy by decidedly non-prolific Swedish filmmaker Roy Andersson. The director’s modus operandi—static, meticulously arranged long takes, shot in deep focus to use background and foreground space—is so entirely unique that it’s impossible to not to get some joy out of just gawking at his films. But Pigeon is a severe case of diminishing returns, falling well short of the comedic and aesthetic highs of Songs From The Second Floor and You, The Living. (There’s nothing here remotely as bewitching as the train wedding daydream from the latter, for example.) Andersson’s bleak view of humanity has always been my least favorite component of his work, and this new one hits that button very hard; it’s most striking image—involving a real-life torture device and the soldiers indifferently leading people into it—is also its most scolding. If this is, as promised, a trilogy, does that mean Andersson is going to try something new the next time? Like, in another seven years? Less ambitious, but more satisfying, was the latest genre subversion from Lucas Belvaux (Rapt), who has a fine habit of complicating basic genre premises. Not My Type (Grade: B+) starts out like the most unadventurous of romantic comedies, sending a snobby Parisian philosopher (Didier Sandre) to a small French city, where he woos a free-spirited hairdresser (Émilie Dequenne, from Rosetta). A more conventional crowdpleaser might have turned this romance into a typical manic-pixie scenario, girl bringing boy out of his shell and teaching him how to cut loose. But the single scene of that happening—and it’s a pretty joyous at that—is a red herring, as the movie instead transforms into a depiction of what might actually happen if these two people from wildly different cultural backgrounds tried to make it work. It helps, too, that Dequenne is radiant and heartbreaking in what could have been a thankless role, delivering not one but two of the best karaoke sequences ever stuck into a movie. Not My Type is a modest triumph, but a triumph nonetheless. I wish I saw this one with a big audience, too.